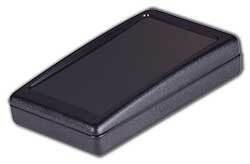 This article covers the uses and benefits of our Handheld series enclosures. SIMCO’s handheld plastic enclosures tend to be perfect for nearly all handheld electronic devices. All of these enclosures will be as cost effective as they tend to be visually pleasing. When it had been developed, SIMCO’s DISCOVERY Series hand-held plastic enclosures ended up our smallest enclosures so far. These cases are designed purposely for any type of handheld piece of equipment like remote control devices, keypads, or additional lightweight devices. They are especially made to furnish the individual a superior amount of diversity. There are six different ways of mixing the bottom and tops giving you more choices. These special tops and bottoms can be exchangeable, giving six diverse looks that can then be made to order with a custom tooling insert for a distinct product. The tailored made tooling inserts are an economical choice for changing these handheld enclosures, saving money and time while providing the enclosure specific uses and looks. Slots for custom controls and LED screens, cut-outs for switches, bezels, speaker grills and connectors and are all options that can be made using this technique for supplementary modification. Hand-held enclosures tops have two styles of lids to pick from. One is a angled top version with streamlined profile with angled lines for products with a high visualness. The other one is a flat cover that is ideal for all-purpose applications. The construction is not at all unattractive, yet it is simplistic and very functional. Four bottom are also offered. One of the bottom covers is flat, as the other three offer battery compartments that can hold batteries ranging from triple A to 9 volt. The battery area is molded in compartment and comes with a completely removable door and a positive catch. All of the bottom covers have pc bosses for mounting your circuit boards. Adhesive rubber feet are also included to keep the product from slipping off of a counter top. SIMCO uses high quality ABS impact plastic pellets for the Handheld Series enclosures. ABS is resistant to scratching and scuffing and has a soft texture. Our standard colors are black, dark grey PC bone grey. SIMCO offers more options such as EMI/RFI shielding, UL fire rated materials, and special order colors that will enhance your product. SIMCO has more sizes of in-stock enclosures that were designed for a particular customer in mind – the 150×75 plastic enclosure. All of our CHALLENGER Desktop Series enclosures have a recessed area to enhance its visual appearance. The inside of this stock enclosure has PC card guides for vertical mounting and mounting bosses for horizontal mounting. The PC board bosses can be removed upon request. These will aid in installing your electronics however. Other desirable features such as the front and rear panels can be made to reduce customization expenses, such as holes for ventilation and other needed cut-outs. Just like all the other Desk Top Series and Hand Held Series enclosures from SIMCO, the 150×75 can be molded from high quality ABS impact plastic materials. Using ABS plastic offers the enclosures a comfortable, soft suede feel when held and is scratch resistant – an important feature for plastic cases. Interesting article, with lots of good information.